The shapes silhouetted against the fiery skies are unmistakable. Saguaro Cactuses live in the Sonoran Desert which makes up only a small portion of desert land in the United States, occupying a small part of Southeast California, South and Southwest Arizona and parts of Mexico. Yet you have no doubt seen these colossal plants in tv shows, movies, logos and anywhere else the desert is being depicted. 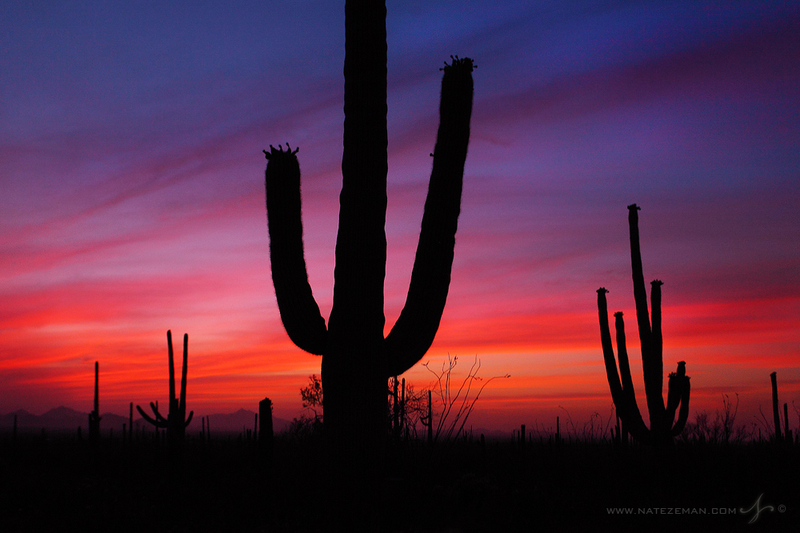 Saguaros have come to serve as the universal symbol of the Desert Southwest. I would credit this to their conspicuous nature and their almost human like attributes. Saguaros grow in all different shapes and sizes, but for this image I spent a lot of time searching for a scene that would be dominated by a very classic looking two armed cactus. Luckily, I was also awarded an absoultely amazing sunset which allowed me to create this timeless image.